Hinman’s answer to innovation, research, and science means you’ll benefit from cutting edge differentiation, affordability and growth. We recognized that in this fast-paced generation, brilliant ideas are too precious to miss. By harnessing the many creative and innovative ideas Hinman engineers bring to the table, we deliver the best ongoing user/client experiences. Hinman developed HI-Tech Labs®, a small but professional internal department, and charged them with new technology research and development to enable continuous product and quality improvements. Led by a team who inspires enterprise insight beyond current needs, the group uses strategic thought to anticipate emerging requirements and disruptive outcomes in global safety. HI-Tech Labs® take great pride in our offerings and strive to ensure Hinman teams continue to exceed expectations. From small jobs to multi-story LEED Platinum building designs, to blast analysis and overall cost benefit studies, HI-Tech Labs(R)' tools provide Hinman the ability to meet client requirements - in cost and architectural integrity - no matter the protection level. The market boasts an array of off-the-shelf analysis and modeling tools but to use them well requires a complicated combination of programs. HI-Tech Labs® offers a proprietary software suite that aids analysis in worldwide hazards and threats to buildings and campuses. Built on a Matlab® platform, our tools take artificial intelligence, Chaos Theory, and ongoing research developments and combine them with the latest criteria and requirements to provide users with a tool capable of delivering needed solutions. Hinman’s highly skilled and motivated professionals, dedicated to producing high quality protective design and collaboratively meeting evolving needs, distinguish our firm from the competition. An array of non-linear structural dynamics analytical tools, ranging from lumped mass models to advanced finite element analysis, allow Hinman to evaluate structural complexities and select cost effective and appropriate methodology to meet project needs. Our resources include in-house, proprietary computer models and select government sponsored software packages that evaluate the structural response to extreme loads and progressive collapse potential. Hinman's Blast Analysis Modules (BAM(R)) evolve in our never-ending quest for improvement. They are continually reviewed and validated against current industry-standard methodologies and experimental data. Our in-house software suite, BAM, includes close to 100 modules used to determine explosive air-blast parameters and resulting structural behaviors of critical components such as windows, walls, cladding elements, columns, slabs, beams and girders. Because every building has unique characteristics, our models are designed to accommodate a variety of material properties, support conditions, connection details, air-blast parameters and geometries, allowing them to accurately predict building behaviors under severe loading conditions. Numerical methods are used to evaluate response, solving governing differential equations as functions of time and incorporate strain hardening effects, damping and non-linear material behavior. Evaluation outputs include: displacement as a function of time, peak displacement, ductility, support rotation, reaction loads and rebound effects. Hinman uses high-fidelity modeling to help clients validate performance and reduce construction costs. Our firm employs the state-of-the-art multi-physics software LS-DYNA, developed by the Livermore Software Technology Corporation (LSTC). LS-DYNA is a finite element analysis package used for a range of engineering simulations including: automotive crashworthiness testing, non-linear dynamic seismic structural analysis (incorporating fluid-structure interaction), blast and impact analyses and analyses of structural performance in fires. Hinman staff has used LS-Dyna for 10 years and have extensive experience running high-level engineering analyses for extreme loading including impact, blast, vibration, earthquake and progressive collapse. Hinman’s unique combination of industry experts and superior technological capabilities continues to afford our clients the most appropriate and economical protection solutions. Hinman encourages innovation and has a reputation for translating highly technical knowledge into elegant, practical and affordable design solutions. Long ago, Eve Hinman made a commitment to stay on the industry forefront. The firm believes in research and new technology investment to continually improve our team’s knowledge and techniques. In traditional blast engineering, threat sizes and locations must be known or reasonably assumed in order to provide structural damage estimates caused by extreme events, structural geometry, structural member sizes or material properties. This means that, to quantify damages, structures need to be first designed, and then analyzed for extreme loading effects - a lengthy and costly engineering process requiring repeated iteration before desirable designs are achieved. To reduce wasted time and expense, we have developed an alternate analytical methodology using Info-Gap and Chaos Theories. Our quantitative methodology can estimate the most likely structural damages without requiring a full structural design. The models, based on topology, derive expected damage possibilities and quantify them using Chaos Theory before applying Info-Gap theory. Info-Gap theory identifies likely damage scenarios by increasing robustness. 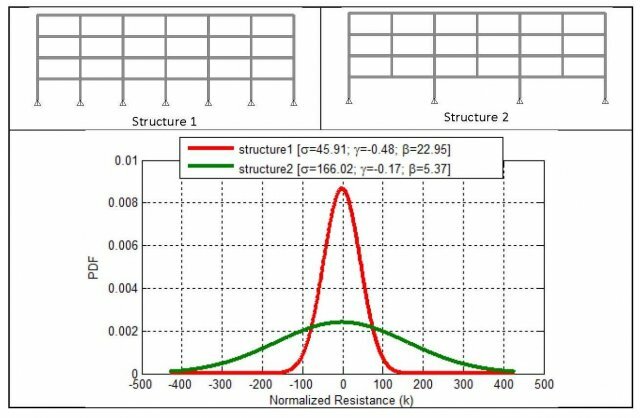 The structural robustness indicator is based on the concept of structural integrity, uncompromised by small variations in initial assumptions. This approach enables us to evaluate the "effectiveness" of one structural configuration over another. With unlimited resources, nearly any structure can be configured (strengthened) to withstand initiating damage. In reality and in terms of cost-effectiveness, it makes more sense to strengthen some structures over others. To determine the magnitude of various perturbation effects and enable us to show you how easy it would be to strengthen structural systems against initial damage, we employ principles of the Chaos Theory, whose concept is illustrated in Figure B. By comparing Structure 1 and Structure 2 we can determine that Structure 1 appears to be more robust.